The Kennebec Valley is best known for fertile farmlands, countless lakes, streams and ponds, and the Kennebec River. While all types of outdoor activities abound throughout the valley, whitewater rafting on many of the beautiful rivers that flow through this region is especially important. While the Kennebec Valley contains some of Maine’s largest cities – Waterville, Skowhegan and Maine’s capitol city, Augusta – it is best known for its rolling countryside and quiet, old-fashioned villages that define the Winthrop, China and Belgrade Lakes area and others to the north. Families are especially attracted to this region because of the many opportunities to boat, fish, canoe, hike or bike. Sightseeing is also a favorite activity on most people’s agenda, as are antique hunting and shopping at the numerous vegetable stands and garage sales found on many of the area’s back roads. While the northern portion of this extensive region is less populated, it is certainly no less attractive. It features magnificent large tracts of open space, spectacular scenic views and more than an occasional glimpse of Maine’s wildlife. Of course, state fairs are a staple of this entire region and none is bigger than the Skowhegan State Fair in August. It is the oldest continuously operating state fair in the country. History also plays an important role in the Kennebec Valley. For instance,Maine’s capitol city – Augusta – while the second smallest in the United States (only Montpelier, Vermont, has fewer residents) – offers tours of several museums, historic homes and the old Fort Western, the oldest surviving wooden fort in New England. Speaking of history, Gardiner and Hallowell are quaint river towns considered antique centers. Both feature historic downtowns that remind visitors of a bygone era and invite them to sample several interesting restaurants, boutiques and art galleries. In addition, a major roadway – Route 201 – follows the trail Benedict Arnold took during his march to Quebec in 1775. A beautiful ride, especially during the late summer and early fall, Route 201, The Kennebec-Chaudiere International Corridor, will take you to the northern portion of this region, which is mostly owned by the paper companies that manage Maine’s huge forest industry. Paper and pulp is the state’s largest industry, and it’s easy to understand when you realize trees cover 90 percent of Maine. Once there, you’ll discover The Forks, a major outdoor and whitewater rafting area lying at the confluence of the Dead River from the west and the Kennebec River from the east. More than a dozen whitewater rafting outfits are now housed in The Forks. Near the Forks is Moxie Falls, one of Maine’s highest waterfalls and one of the state’s most beautiful sites. Route 201 then pushes north to the Canadian border at Jackman – a four season recreational area heavily involved in whitewater rafting, rock climbing, hiking and mountain biking. There are several things to see and places to visit in this region. The Blaine House in Augusta, built in 1833, was given to the state in 1919 to be used as the Governor’s mansion. The State House in Augusta was designed by noted Boston architect Charles Bulfinch and built in 1829. The Maine State Museum in Augusta houses some of the most historic artifacts in Maine, especially those associated with the Native Americans who lived in the area. Old Fort Western in Augusta is New England’s oldest surviving wooden fort. Costumed museum teachers interpret 18th century military, settlement, trade and family life in the original main house built in 1754. The L.C. Bates Museum in Hinkley is known for its exhibits of natural history housed in a 1903 school building. Collections include natural history, Americana, art, archeology and ethnology. Fort Halifax in Winslow was the oldest blockhouse in the United States before it was destroyed in an April flood in 1987. A reconstructed blockhouse – which includes many of the original timbers – now stands on the Fort’s original site. The Pittsfield Train Depot Museum features Civil War, railroad, and Lance House Hotel memorabilia. Arnold’s Landing in Solon is the site of Benedict Arnold’s camp. Moxie Falls, one of Maine’s highest waterfalls (96-foot drop), is located two miles north of The Forks. The Waterville Opera House is home to local, national and international theater, music and film performances. Colby College Museum of Art in Waterville emphasizes American Art and collections by John Marin and Alex Katz. Annual Whatever Family Festival on the Kennebec River from Augusta to Gardiner – features parades, foods, water sports and water races – late June. Pittston Fair – agricultural fair with a midway – end of June. Old Hallowell Days – parade, crafts, music – mid-July. Central Maine Egg Festival in Pittsfield – mid-July. Richmond Days – late July. Skowhegan State Fair – top attraction – early August. Common Ground Country Fair in Unity – a true agricultural fair – September. 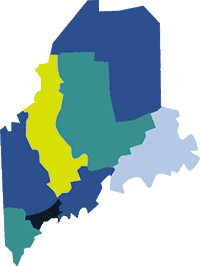 For exact dates and a more complete listing, check the calendar of events at VisitMaine.